Ed was first introduced to yoga in 1999. He had heard of yoga and how "relaxing" it is. After his first class his body felt anything but relaxed. He was sore in places he didn't even know he had muscles. Although he felt discomfort initially he found a peace within himself he hadn't felt before. He stuck with his practice and soon found yoga was the perfect fit for him. His body began to get stronger and so did his mind. After a number of years of practice with many different instructors he found himself in a position of wanting to share this magnificent gift with others. 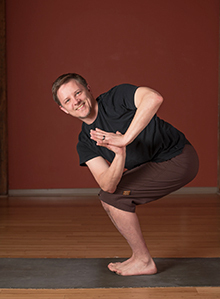 In 2012 he graduated from Rolf Gates 200-hr Vinyasa Teacher Training. Ed's class is a combination of creative playfulness and challenge. He believes that when people find the right places to engage, the body will form into correct alignment. Ed offers hands on adjustments and encourages questions from students so they may find their true potential. Ed holds a tremendous amount of gratitude to all the teachers he has worked with in the past. Some of which are Bryan Kest, Seane Corn, Schyler Grant and Sadie Nardini. He feels blessed to be able to share this gift with the people of this world.